I also recommend Colose's effort. Some thoughts: I know you're using the vernacular, but I wince when I see 'heat' being used as an adjective for IR. But then you're being inconsistent, as later you refer to the IR as 'light'. If we're using vernacular, perhaps 'light' should be reserved for the visible, or explain that 'light' includes IR, or just be consistent and use the same word throughout. After that.. I think Mom would still be confused, but that's best tested on her. A correction and some questions. First, 380ppm works out to .00038%, not .038%. Fairly significant difference. And I wouldn't call that number a "significant amount." Second, if the increase in CO2 means an increase in temps--which is how I read your breakdown--why have temps not risen in lockstep with CO2? If CO2 is the forcing factor because it prevents heat from escaping, why is there not a more direct correlation? CO2 has risen over the last 10 years, but temps have not followed as one would expect given the math. Last question, why use a pseudonym? If you're going to be smug, you could try to be right first. Smug? Last time I checked 380 divided by 1,000,000 is .00038. So where am I wrong? And I don't consider that a "large number." The question is a genuine one. Not trying to be right. Trying to understand why, if there is such a direct correlation, we don't see it happening. And then the % sign? As for your lock-step question: First, you need the sum of all forcings; CO2 is not the only show in town. But the more conceptual point is that even in the absence of changes in external forcings like CO2, methane, solar changes, orbital changes, volcanoes, aerosols, soot, etc, the measured surface temperatures will still fluctuate a lot from year to year. You'll still have hot years associated with El Nino, and so on. Those fluctuations are superimposed on the trends due to external forcings. If the forcings are really strong, they are apparent in the short term despite those fluctuations (as with a big volcano, like Pinatubo 1991). If they are less strong, then you may need to look across 15-30 years for the trend to statistically apparent. That's where the current sum of forcings is (CO2+CH4+solar+aerosols+yadda yadda). If they are super-slow like orbital changes, then they're happening I guess, but you've got to look over thousands of years to notice any effect. Bad math on my part. Divide by 10,000, not 1,000,000. My apologies for the remark. Not sure I agree with the basics of the answer but will give it some thought. It would seem to me there should be a more direct and noticeable correlation--even in the short term--if the cause and effect is so directly intertwined. Again, sorry about questioning the math. Wasn't trying to be smug. Well, first of all 0.038% is 0.00038 as a fraction, so that's what you were thinking of. Third, in one cm3 of air there is about 8 x 10^15 CO2 molecules, so that is quite a bit, the average distance between CO2 molecules is about 2 x 10^-5 cm, or about 20 microns, which, amusingly enough is about the wavelength of the IR light that is absorbed, in that very crude sense, the IR light always is near a CO2 molecule that can absorb it. Fourth CE has it pretty much right. Think it over, then. If it makes you feel any better, the models show the same sort of behavior - a lot of random-looking variability superimposed on the trend. When you run the models many times, you can get many different looking results (colored lines). Take the average of all that (dark black line), and the random-looking noise cancels out and you get a cleaner looking trend. But real life does not correspond to the average, but rather could correspond to any of the many colored noisy lines. As of now, and perhaps forever, it is not possible to predict which of the colored lines the climate will follow in the short term. This is basically the butterfly/chaos problem. Though some people are trying. But if you found the trend over the long term (30+ years), you'd expect to see a trend similar to that of the mean. Here's my problem with the chart at RealClimate. Or more to the point, the theory. Back in the 90s, when temps were rising, we heard that it was due to the rise of CO2. Essentially there was a direct correlation we were told. As temps rise, oceans warm and release CO2, so I would expect that there would be a chain reaction event, and that the temp rise would feed the output of CO2 which would warm the planet and the cycle would continue. This would say to me that we would see this in the short term in addition to the longer. But that does not seem to be the case. So, we can say the last decade of relative temperature flatness is a "weather event" but could we not have said that about the previous decade when warming was the most noticeable? Lastly, are the temperature reading stations used in 1950 the same as the ones used in 2000, or now, and if not does that not call into question the validity of the temp data? This post is probably relevent for answering BW ANonymous, don't you think? turbo: This is not a concern troll; it's not pretending to be anything but sceptical. Darn it, did I lose a long reply to cyberspace? Little Mouse understands Infra red as light. He has seen the IR pictures, IR cameras and night vision goggles. You make it sound like CO2 is almost saturated and more would not add much to the greenhouse effect. Or is this a good way of eaxplaining the logarithmic nature of more CO2? Is good. Did not have to clean up mouse brains. For BW, I'll retype. If it ends up a repost, sorry to all; Eli can delete. I don't know what you know or don't know BW, so don't take offense if this is pedantic. First, the carbon-cycle feedback you describe (warmer oceans taking up a lower % of emitted carbon, leading to faster warming) is not expected to happen any time soon. Maybe we're starting to seeing hints of it now, just maybe. And if it happened, it would be the oceans taking up a lower fraction of the emitted CO2, not the oceans net releasing CO2. Second, you seem to recall short-term warming in the 80s or 90s, so you wonder why I'm talking short term/long term now. Well, go back in the data and see what actually happened back then. Plot some short term trends. Actually get the linear slopes, because the eyeball tends to connect the endpoints instead of doing linear regression. Try all the 5 year trends, since 1975. You get all sorts of slopes. You can get negative slopes right smack in the middle of an obvious warming period. Try 8 years. Turns out, RC did that already. Then try maybe 10 and 15 year trends. You see that by the time you get to 15, things stabilise a bit. Now, I'll admit I'm cheating a bit here. Look on the RC plot, and you'll see a couple volcanoes going off. So any negative slopes around those times are related to that forcing, not just random noise. So if you haven't done this before, have a go. See what short and longer term trends look like, since 1975. Maybe you'll see that the last decade really isn't any different from the previous two. Or maybe you'll disagree. But try it out. The sceptics just found it handy that if they carefully chose the right data set (it won't work in all of them) and the right starting year, they can finagle a negative trend out of the data upto the present. This won't work for them much longer, as 2010 has started off on a hot foot with an El Nino. I'll leave the station changes aside for now; one thing at a time. Hi Eli. Good work. By the way, what's "heatl"? Personally, I wasn't really expecting and never got the impression that positive feedbacks would be exhibited so soon in the global warming, which is what BW is describing. Gaz: For me, 'heat' is a more general term for the transport of thermal energy through whichever channel: conduction, convection, radiation. So all radiation, regardless of wavelength, is heat transfer. This particular feedback is discussed via the 'airborne fraction' concept in recent papers by Knorr, Canadell and Le Quere. Knorr wrote he detected no change in the fraction of emitted carbon that was going into the atmosphere, and the septic-sphere freaked out because they thought it meant the airborne concentration wasn't increasing. Le Quere, on the other hand, pokes around the oceans and sees preliminary signs of reduced uptake. Concern Troll? That is an interesting one I must say. No, I am genuinely skeptical, but not to the point where I think stolen/leaked emails are proof of anything. Suspicious perhaps. I am not of the opinion that we are blameless as a species, just that I think the issue is over hyped and there are many areas I find could be easily skewed to fit an agenda. To this point I happen to think, unlike Eli, that Gore is the climate scientists enemy, not his friend. I think the issue is a valid one to the point that environmental happiness is good, pollution is bad, and we should act without all the rhetoric to make the world a better place. I am not, however, convinced of the doomsday scenario espoused by the IPCC and Gore and his ilk. But I wouldn't have come here if I was not genuinely interested. There seems to be less of the arrogant "it is what it is because we say it is" mantra, though it is not without SOME of that mentality. If you want the message to ring clear, talking down to anyone you disagree with is not a good way to get it done. Many on the AGW side do not seem to see it that way and, in doing so, hurt the cause more than they help. There are plenty of idiots out there who will jump and say "see, you were wrong all along. THEY LIED!" That is, of course, hyperbolic. But so is saying that anyone who is not sold is a fool. CE, thanks for the response. A question. What is the theory behind why it is thought that we would only now be seeing "hints" of the CO2 feedback cycle chain reaction when the planet has been, for the most part, warming since the end of the last ice age? Would we not expect to see such a cycle naturally at some point? Seems logical that once the process starts it would be damn near impossible to stop--a natural "tipping point" so to speak. But it also seems logical to think the "start" was many years before there were cars, or people for that matter. Again, genuine question. Not baiting. Eli --- "Below that level, energy emitted from the the" maybe needs an elision. BW --- Look at all 130 years of GISTEMP temperature data. Turn it into decadal averages so you only have 13 data to work with. Do the same for the CO2 data. Apply the Arrhenius formula to the CO2 data to estimate GISTEMP. This will account for 94% of the observed variance. I've posted about this recently on the Whatevergate thread on RealClimate. BW: Don't worry; the fact that you came back and admitted the math error made me realise you are here in good faith. Doomsday scenarios - I'd never use language like that. I'd just spell out the range of things that could happen. If they happen to be adverse, what can you do. As for the speed of different feedbacks: you have to understand the physics of them, and there are many of these feedbacks. None of them are expected to be runaways. They just amplify the warming a bit, so the final temperature (once things settle down) is higher than it otherwise would have been. And in fact, we do see them naturally. These feedbacks kick in, no matter what causes the initial warming; the feedbacks don't know or care if it was natural or human. The feedbacks are critical for understanding how the earth can get into and out of ice ages, in the first place. Without these feedbacks, you wouldn't get the full temperature swing that's observed in the ice age cycles. Though we have not been warming for the entire 10k years since the last ice age. I don't think it's correct to say that it has. - maybe increased vegetation, leading to a higher carbon sink? - ice-albedo: ice and snow reflect sunlight. Melt them, and you absorb more sunlight. This is a big part of the ice age cycles. - carbon cycle: this is complicated. Coming out of an ice age, as you warm up, you release carbon from somewhere (probably oceans), to get more warming. Currently, the oceans are a carbon sink; on net carbon goes into them, and reduces the pH to boot. But they could possibly take up carbon more slowly in the future. This is where you started, but I don't have the background to really explain how fast this should happen, sorry. It's a complicated mix of the solubility of CO2, marine wildlife feedbacks, and ocean circulation. - permafrost/methane: warm up a bit, and methane trapped in the permafrost can come out. methane is a greenhouse gas. There could be others I forgot. If there's a particular one that interests you, ask and maybe somebody will pipe up about it. The water vapor one is probably the most familiar one. If nothing else, there are relevant sections in the IPCC WG1, which is really the best place to start. Just a quick thanks for this post (and all the discussion following). I'm about as far from scientific as you can get but I'm trying to understand the science behind all the discussion, this is good stuff. the sloooowest feedbacks of all are also in the carbon cycle - most of the emitted carbon is going to end up as limestone at the bottom of the ocean, if you wait long enough. At least a thousand years, per David Archer? And then if you wait even longer, some of that carbon will go down into the earth and come back up as volcano burp. We don't talk about these things much, but there are cycles on all time scales. So just because a feedback can exist, don't expect it to kick in very quickly. ...for those who would like to understand the above discussion. Eli, where'd you get the "the average distance light will travel before being captured is a few meters " from??? I ran the numbers a while back when somebody claimed something like that and it seemed to me they were off by a couple of orders of magnitude. Of course there's various line broadening effects that change things, so it's not a straightforward calculation. Anyway, just curious if there's a good reference on that distance. A nice, simple explanation from Eli for all of us, like me, who need nice, simple explanations. But I am a little bit puzzled because nobody ever seems to notice that heat and temperature are two quite different things. You know, you add a little bit of heat to some air, and its temperature rises markedly, but you add a real lot of heat to some water, and its temperature barely changes. And if you add a lot of heat to some ice, then when it gets to 0degC, you can add a lot more heat and it only changes to water at the same, 0degc temerature. Somebody once told me that this is called the latent heat of phase transition, or something. So maybe some day somebody could explain to me why it is that the sun adds heat to the earth, which is then distributed to all sorts of 'heat sinks' - including huge ice masses - but then the discussion is always purely in terms of 'temperature'. When someone says that 380 ppm sounds too small to be "significant" I mention that a well treated swimming pool has "only" about 2 ppm chlorine. Run an IR spectrometer without a blank. The beam path is about a meter and you easily lose 10-20% in the CO2 bands for one thing. Alternatively go play around with spectracalc.com. for a 10 m path you lose about 50% at stp in the CO2 bands (you can see this by setting the bandpass of the spectrometer to ~2 cm-1 which averages over the lines. If you look at ultimate resolution the lines are pretty well saturated. Grim, because it is a hell of a lot easier to measure temperature than heat content. It is only in the last ten years or so that we have put together the tools to measure ocean heat content (google Argo floats) but we have temperature records going back 300 years (Central England) and enough around the globe to put together a temperature record for 150 years. You use what you got. A good example of this is the MSU satellite temperature measurements. The instruments were never designed to measure temperature, but Christy and Spencer figured out how to do it. That was an interesting development. The original reconstruction appeared to contradict the models, so the question was which to believe. Guess which was wrong (but could be fixed). One of the biggest problems I see when trying to explain how the greenhouse effect works is not so much the atmospheric radiative transfer, but the basic physics of heat transfer by radiation. The sticking point seems to be the difference between net radiative heat transfer between two surfaces at different temperatures and gross radiative flux from an individual surface, as in: "You can't transfer heat from a colder object to a warmer object." I'm not quite that simple, or at least I hope I'm not. I understand, after a fashion, the concept of proxies, and the necessity to 'use what you have'. Temperature is a good measure of heat in homogenous media, but the Earth is a most decidely heterogeneous medium. So I'm still left puzzled as to why, when yet again (and again and yet again) the relationship between CO2 and temperature is shown to be non-monotonic and non-linear (as it cannot otherwise be in a very heterogeneous medium such as the surface and atmosphere of the Earth), that the discussion is almost entirely in terms of the 'forcings'. Now in my simple mind, a huge amount of Arctic (and Himalayan and Antarctic) ice has melted lately. Doesn't that imply that a huge amount of the heat that has been supplied to planet Earth has 'disappeared' (ie fails to show up as temperature increase) as latent heat of phase transition ? Was there as much ice melt during earlier times (eg leading up to and including the 1990s) when the relationship between CO2 and atmospheric temperature appeared perhaps a little more 'linear' ? I'm sorry, but I just don't see how a discussion limited to easily measurable temperature can give us any real understanding of what is actually happening. "When someone says that 380 ppm sounds too small to be "significant" I mention that a well treated swimming pool has "only" about 2 ppm chlorine." Pre-industrial earth, 200ppm (ish) CO2. Earth with melting ice caps, glaciers and permafrost, 400ppm CO2 (ish). As for the trace gas argument, not a perfect analogy, but think what CFCs (pptv) have done to the ozone layer (in the stratosphere) above Antarctica. CO2 is measured in ppmv, two order so magnitude higher. The point being that a trace gas can have very significant consequences in very remote locations far removed from the source. PS: If Eli thinks this is a stupid analogy, please tell me so I don't go around making a fool of myself. Thanks. The atmosphere weighs 10.3 metric tons per square meter at sea level. Given a preindustrial atmospheric CO2 concentration of 280 ppm, there were at that time 2.9 kg CO2 per square metre of surface area at sea level. Human emissions have increased the atmospheric CO2 concentration to 385 ppm, which is 4.0 kg per square metre, or an extra 1.1 kg per square metre. Even without working out the infra-red absorbing capacity of this extra CO2, and what it represents in terms of the overall greenhouse effect, even a lay person should be able to understand that an extra 1.1 kg of heat-absorbing 'blanket' per square metre represents a non-trivial addition. Since you clearly know virtually nothing, it is immensely arrogant to make such a statement. The IPCC finding is a conservative evaluation of the current science; you would do well to familiarize yourself with both. And Gore, unlike you, is informed about the current science and his claims, for the most part, reflect it. First, 380ppm works out to .00038%, not .038%. Fairly significant difference. Here's another example of arrogance (or what someone called smugness). When you are about to accuse someone of making a very stupid mistake, you have the obligation to check your work several times to be sure that you didn't make a very stupid mistake. And I wouldn't call that number a "significant amount." Who are you quoting? Yours is the first instance here of the word "significant". In any case, as others have pointed out, significance is a matter of consequence, not merely amount. I use a similar point. But forget the CFCs themselves, as climate septics can overlap with CFC septics. Just point to the ozone itself. Overall, the concentration of ozone is much less than CO2. Even in the ozone layer, I think this is so. So long as ozone does something that the other gases don't, it'll be important. Grumbine tried to tack of estimating the number of CO2 molecules in a column of air. Just punch that person in the face. There's no point talking to him. This is a nice and simple explanation of why more CO2 molecules still raises the atmospheric temperatures, even if the CO2 absorption bands at the surface are nearly saturated. I'm often struggling with how to explain this in an understandable way; I'll take this as an example. Grim, as is usual in such things you can get a grip on them by throwing distractions away. In terms of stored energy the only thing that counts is the upper ocean. In terms of energy flows, the only things that count are the surface, the atmosphere and the upper ocean which can rapidly exchange heat with each other on a sub annual time scale. Each part of the Earth's surface emits heat IN THE FORM OF INFRARED (IR) radiation. means there are fewer greenhouse gas molecules available to ABSORB or radiate the energy. "The atmosphere is too diffuse to hold much energy compared to the atmosphere "
Another misconception BW has is that "the planet has been, for the most part, warming since the end of the last ice age" when it has not. In fact the planet has generally been cooling since the peak of the Holocene Climate Optimum 7000-8000 years ago, driven by a slow and steady decease in northern hemisphere summer solar insolation due to the Milankovitch orbital cycles. This means something has not just offset the steady drop in insolation but produced a century of steady net warming. Something like a measured accelerating increase in the concentration of known greenhouse gases. It's funny when you don't catch an error, even when you re-read it. Brain can do funny things. Is there anything wrong with describing atmospheric co2 as a heat shield (for super-simplified purposes) in that it stops IR and radiates some back? I'm thinking in terms of very concrete examples relatable to everyday experience. "Since you clearly know virtually nothing, it is immensely arrogant to make such a statement. The IPCC finding is a conservative evaluation of the current science; you would do well to familiarize yourself with both. And Gore, unlike you, is informed about the current science and his claims, for the most part, reflect it." First, I owned my math error and apologized for the comment. With that said, it is the arrogance of people like yourself that is driving the nail into the coffin of your side of the debate. It's a shame you cannot see that. I "clearly know virtually nothing?" Bit of a sweeping generalization don't you think? But you are obviously so much smarter than I am. At least you think so. Or you can continue to keep the arrogant stance that you know more than the rest of the world and, not surprisingly, more and more people will continue to ignore you. Unfortunate for you that you seem to have so much anger towards those with whom you don't agree and that insults, or attempts at them, are your method of response. Good luck to you. I won't be returning to see your response so don't bother unless you feel the need to prop your ego for the rest. Yeah, the metaphor is backward. The incoming energy (visible light) comes through, the surface warms, and the outgoing energy (infrared) is held close and spread around before it gets away. Shields protect you from _incoming_ stuff. Say hi to the Moonies at your source of information. I meant to compare co2 to a heat shield for a wood stove or a catalytic converter. Or just about anything between you and a bonfire. The point isn't the "shield", it's that it's easier to think about than increasing photon paths. For explaining to mom, of course. Badger, you are going to run into a lot of pedantry about this because the analogy is strained. Greenhouse gases work because they let sunlight through while limiting emission of IR in narrow wavelength regions. It's like a peculiar type of one way valve. Eli is working on a more elaborate explanation with drawings that he hopes to post soon, but he is very happy with this short one (Thanks Bart:)! Pendantically speaking, the heat shield by itself is weak. But this is an elevator speech for the laity I'm aiming for -- people who've mostly just heard about hockey sticks and numerical models. I don't think many people realize how much it's based on plain ol' physics. If anybody can suggest anything better, I'd be relieved to hear it. What has worked for you? Greenhouse gases limit the rate at which the earth can shed the energy it receives from the sun. Increase CO2 and the earth warms. Thank you for the description. I particularly liked the temperature and density charts - good basic data. In my search for descriptive models, "what I think I have learned" is that these two additional concepts are important to the model. First - As described in your post, an IR photon can be absorbed by CO2 (or other 'greenhouse' gas). What happens next? That CO2 molecule could re-release the photon, up or down, to be reabsorbed by other CO2 molecules, etc. However, 'what I think I have learned' is that it is 10,000 times MORE LIKELY that the CO2 will bump into an O2 or N2 molecule in the surrounding air, exchanging that photon of energy into kinetic energy in the air. Why is that important? The O2 and N2 release radiant energy in DIFFERENT WAVELENGTHS, effectively throwing open the 'narrow doorway to space'. This concept is not covered much in Climate discussions, and I would like to understand the physics better, but the "10,000 times more likely" energy exchange in the atmosphere does seem to be true. Second - The most important 'greenhouse gas' is ... Water vapor. The CO2 value of 0.038% is on a 'dry air' basis. Depending on where you look in the atmosphere, the H2O can be near zero, up to about 5% by volume. So a nominal 2% to 4% H20 is roughly 100 times more (by volume) than the CO2. Why is that important? 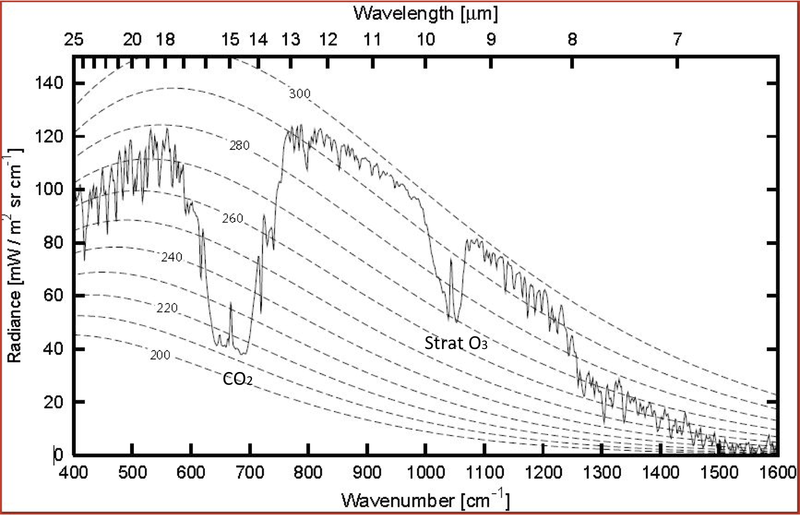 Water vapor also absorbs IR in the wavelength where CO2 absorbs strongly. Knowledgeable scientists who have done the calculations, tell us that water as vapor and as clouds account for as much as 95% of the 'greenhouse' effect, leaving the contribution of "CO2 plus all other" greenhouse gasses at around 5%. Inbound light (short) wavelengths that pass through the atmosphere are absorbed by land and oceans. Energy is re-emitted in the form of (long) infrared (IR) radiation. This IR emission includes wavelengths that are absorbed by H2O, CO2 and other greenhouse gasses. The absorbed IR in the atmosphere can be re-emitted as an IR photon in those same wavelengths, but most of the energy is transferred to the surrounding air as heat, warming the air. Air is mostly O2 and N2, which can release that energy in other wavelengths that more readily pass out to space. Clouds are also an important contributor, sometimes 'trapping' (long wave) energy, sometimes reflecting (short) inbound light back out to space, and sometimes moving energy higher in the atmosphere via vaporization and condensation processes (such as a thunderstorm). Older climate models do not handle clouds very well, so have over-estimated the greenhouse contribution of CO2. You said, "The atmosphere weighs 10.3 metric tons per square meter at sea level. Given a preindustrial atmospheric CO2 concentration of 280 ppm, there were at that time 2.9 kg CO2 per square metre of surface area at sea level." Your 2.9 kg CO2 obviously comes from 10.3*10^3*280*10^-6. But you forget that it is 280ppm by volume, not ppm by mass. CO2 has mol.wt. 44. Average mol.wt. of molecules in air, taking it as 20%O2 and 80%N2 is 28.8. So, your figures for masses of CO2 need to be multiplied by (approx.) 44/28.8. ie. increase in mass of CO2 per m^2 is c. 1.1*44/28.8 = 1.7kg. There is a lot wrong with what Del Dave claims. Second, the energy in the excited CO2 is mostly degraded into kinetic energy (thermal motion) of all of the molecules. Third, the CO2 bend is at a lot lower energy than the O2 or N2 vibrational excitation, so while the CO2 bend can be re-excited by collisions, it is very unlikely that there will be enough energy to excite the N2 or O2 vibration or the CO2 stretches. 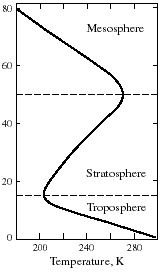 Fourth, water vapor decreases strongly with altitude because of condensation so CO2 is more prevalent high up in the troposphere, and almost no H2O gets through the tropopause. Eli does, however, need to say something about water vapor in the continuation. Well, you could try "it's like a mostly one-way mirror, but for heat"
The 'bathtub model' might be clearer and simpler, and has a website you can send people to --"it's like when the drain begins to get clogged with hair while you're taking a shower -- you haven't turned the shower up, but the water starts to rise around your ankles because it's not going out as quickly." Eli said to Mom, "the Earth absorbs energy from the sun and reaches a steady temperature when it radiates the same average amount of energy to space. Scientists would want Eli to insert per unit time here, and that should be understood in everything that follows." Then why are you using "energy" when you mean "power?" Does your mom prefer horse-energy to horse-power for automobile engines, or joules to watts for light bulbs? But instead of telling Mom all this complicated stuff, just take two sheets of glass outside on a sunny day and hold one over a white sheet of cardboard and the other over a black one, with the sunlight streaming through the glass to warm up the cardboard, with an air gap so no one can complain the cardboard is heating the glass by conduction. Wait five minutes and then feel the glass sheets, holding one in each hand for a few seconds and then switching hands to feel the effect better. Explain to Mom that the reason the glass over the black sheet feels warmer is that the sunlight did not heat either sheet appreciably because they're transparent to visible light, but heated the black sheet more than the white one and the radiation from the former then heated the glass because it's opaque to the infrared light emitted by the warmer black sheet. Also point out that the side facing the black sheet is warmer than the side facing the sun and tell her that "lapse rate" refers to the temperature gradient across the glass. The effect can be strengthened by waiting longer, and by insulating the setup in various ways: thicker glass, perspex (aka acrylic, plexiglas. lucite), or a saran-wrap blanket wrapped loosely but completely once around each of the four objects. The saran wrap works by trapping a thin blanket of insulating air that reduces convective cooling of the objects while still allowing both visible and infrared radiation to pass, being so thin that its main optical impact is not absorption but reflection. It has the additional benefit of further reducing any chance of convective warming of the glass by the cardboard, the point being to demonstrate the effect of radiation in the absence of convection. Remarkably, many climate scientists deny that the glass warms up for the same reason the atmosphere does, citing physicist R.W. Wood's little note in the February 1909 issue of Philosophical Magazine purportedly showing that radiation plays a negligible role by comparison with convection. I thumbed through a few subsequent issues of Phil. Mag. expecting someone to raise the obvious objection (since de Saussure had demonstrated strong warming by this effect in 1767, see http://www.solarcooking.org/saussure.htm ), and bingo: there in the July 1909 issue was a much longer paper by Charles Greeley Abbot, director of the Smithsonian Astronomical Observatory, thoroughly refuting Wood. See http://boole.stanford.edu/wood for more details about that as well as a second failed attempt by Wood a few months later to debunk an unrelated optical effect. In that regard Wood was the Will Happer of his day, though he made up for it with much excellent work in other aspects of optics, inventing Wood's glass, debunking N-rays, etc. At 0.39‰ (0.039%) by volume, atmospheric CO2 seems a negligible component of the atmosphere. One way for Mom to better appreciate it is to point out to her that at a level of 1‰ (0.1%), atmospheric CO2 in its solid form, dry ice, would coat the Earth with a layer 1 cm thick, a handy coincidence. The current level of 0.39‰ would therefore be 0.39 cm thick. Since that's close to the thickness of ordinary glass, and since CO2, glass, and perspex block IR by the same mechanism, namely absorption by triatomic molecules, if not at the exact same wavelengths, the analogy is an excellent one even quantitatively! "bend" as in "wiggle" works and makes sense, but watch for confusion with "band"
Remember, the bend of the bond is the band. I wonder if you'd consider tidying this up and reposting it for longterm reference somewhere (RC Wiki?) -- so the main article has everything from the comments worth incorporating and a permanent home. It's the best place to send people. There is a post at WUWT referring to shields on the saturation argument. "Furthermore, the saturation argument assumes that nothing else goes on after saturation occurs in the first few meters of atmosphere. But the saturated band keeps on emitting in all directions. Infrared radiation doesn’t get swallowed by GHG molecules never to be seen again. In the upper layers of the atmosphere, re-emitted IR eventually escapes to space. Even with complete saturation in the first few meters, if the upper layer gets more CO2 (and it does) then the escape window closes. This is true even if saturation occurs across the CO2 spectrum in the first few meters of atmosphere. I think some people have the idea that energy/heat transport stops at the saturation level, that it’s a kind of shield that prevents any more IR going upwards. What they don’t get is that the ’shield’ is also an emitter." The author apologises for using imprecise terminology, but is the picture basically right? I get the impression that skeptics do think of the saturated band as a shield that 'stops' IR from passing upwards through the atmosphere. I'm asking to see if I can use this analogy. The rate of emission depends on the temperature of the level. The higher the CO2 concentration the higher the level which emits to space is and the colder the temperature. Thanks for the prompt reply, Eli. Is it correct (allowing for the terminology/analogy) to say that the 'shield' in the first few meters of the ground is also an emitter? That's the bit I most wondered about. It certainly seems to me many skeptics think that, in the saturated bands, IR activity ceases beyond the shield. It's a giant game of pass it on, with each higher level taking longer to do so. The net is that when the concentration increases the level that finally passes the energy on to space is doing so very slowly. Not sure how I missed this the first time around, but saw it linked on and then There's Physics.